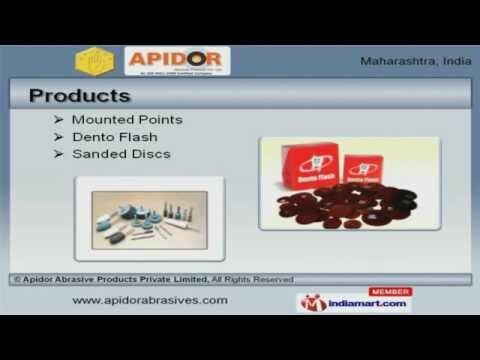 Welcome to Apidor Abrasive Products Private Limited, Manufacturer and Supplier of Abrasives and Cutting Wheels. We are an ISO 9001:2008 certified company, established in 1977 at Mumbai. We are a certified member of BIA, NIMA, BCC & AIMA. Ordinance Factory and Bharat Forge Limited are some of our elite clients and we are backed by Superior quality products and Ethical business policies. We offer a wide array of Mounted Points, Dento Flash and Sanded Discs. Our Chop Cut and Glass Grinding Wheels are best in the industry amongst others. We offer a wide assortment of Ultra Thin and Plain Cut Off Wheels that are available at affordable prices. Standard and Economical Depressed Centre Wheels offered by us are acknowledged for their functionality. Along with that we offer Special Cutting Wheels and Sanded Disc for Drill Press that are extremely reliable. We also provide Glass Grinding Wheels for Lathe Tools and Grinding Wheels for Glass Chamfering that are a class apart.